Seven years ago Methodist Le Bonheur Healthcare in the heart of Memphis struggled with how to bring better health to the underserved. Their first thoughts were, who else would want to make this happen? Were there any potential strategic partners? They looked to see what assets were available in the areas with the worst health issues. They couldn’t help but notice a small church on almost every corner. And many of their patients were connected to those congregations. So they worked with local pastors to develop the Congregational Health Network, CHN. 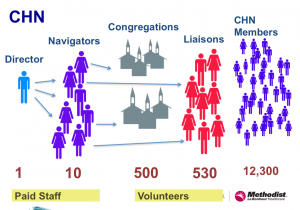 Today the CHN is a partnership between Methodist and more than 500 congregations, mostly in low-income neighborhoods but also spreading into the surrounding region. Each congregation has one or more volunteers, called liaisons, who undergo a training program that’s intense enough to give them college credit. These hundreds of liaisons accompany patients from their congregations or neighborhoods. After they’ve left the hospital, liaisons check in with them in their homes, get them to doctor’s appointments, make sure they have their medicines and help with daily needs. First, if you’re trying to create social change, working on any worthwhile cause, it has to be more than you can handle. So find a partner to share the burden, two are stronger than one. Partners also bring to the effort assets you don’t have, creating greater possibility. 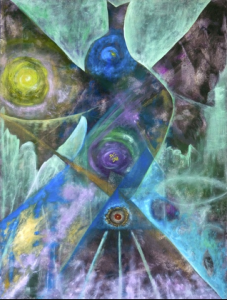 Most exciting, the chemical reaction of the different agents often creates some entirely new, unanticipated result that takes the work to a higher level. Of course, not all partners make sense. You may be in an organization that holds endless debates: Would we partner with this or that corporation, the government, a competitor? Frederick Douglas said, “I will unite with anyone to do good, but with no one to do harm.” You’ll have to find your right place on this (perhaps by trial and error). Be creative and open minded about potential partners. In Beautiful Trouble Joshua Kahn Russell says that it helps to think of groups. 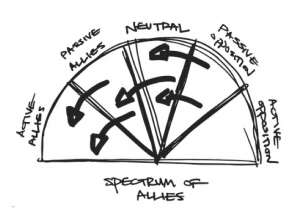 “Successful movement-building hinges on being able to see a society in terms of specific blocs or networks, some of which are institutions (unions, churches, schools), others of which are less visible or cohesive, like youth subcultures or demographic groupings.” Russell points to a “spectrum-of-allies analysis” that is useful in developing a strategy. Social Change partnership in a nutshell. In exploring partnerships, ask what do you have to offer? What are you seeking in an ally? Is this potential partner really good at what they do? Are they the best you can find? Are you both in sync in terms of values and ethics? Once you’ve identified a potential ally, do due diligence. In developing the partnerships be clear about your goals and who is going to do what. Draw boundaries and have an exit strategy. How about a retirement center and a school? In The Element Ken Robinson tells of a retirement center owner in Jenks, Oklahoma, who offered help kids in the elementary school across the street. The school district agreed. Together they set up a preschool/kindergarten glass-walled classroom in the lobby of the retirement center. The program paired an elderly resident with a child for one-on-one activities where each reads in turn. An African proverb says, “If you want to go fast, go alone. If you want to go far, go together.” Perhaps the most important thing you can do once you know where you want to go to create social change is ask, who else might want to go there? Strategic partnership between public health officials and hair salons to save lives by tactfully pre-screening for skin cancer. The “Save the Crabs, Then Eat ‘Em” campaign joins environmentalists, lawn care companies, and restaurants and bars to save the Chesapeake Bay. The Movement is Nested and Crossed. Thunderhead Works.